This is a listing for a 1 inch button badge. Its yellow with red and black writing. 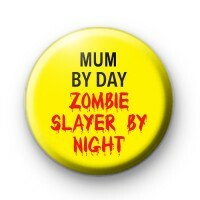 The text reads - Mum By Day, Zombie Slayer By Night. Perfect for Halloween to add to your scary costume or for fans of Zombie TV shows like The Walking Dead.